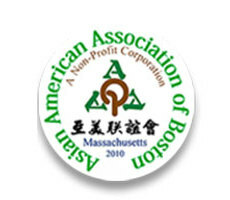 Formed on July 1, 2010, Asian American Association is recognized as a U.S. Federal and Massachusetts nonprofit organization. AAA serves as an important tool for cultural and and artistic exchange of information through members.As a center of friendship through networking and print media, AAA serves as an important tool for cultural and artistic exchange of information through members , between communities, various cultural institutions of Commerce, and Asian American ethnic communities. Through intercity, regional, as well as between China and the U.S. ties, AAA providing a platform for communication, exchange, and cooperation and strives to achieve social harmony.